B4368 west from Craven Arms. 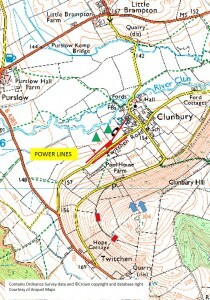 Turn left after Aston on Clun to Clunbury. 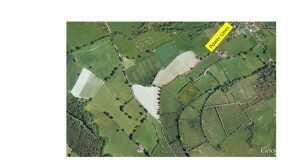 Limited parking space in a small quarry at the bottom, or in field marked. From the quarry, follow the track up and around the west of the hill. At the gate at the end of the track, turn left to the top of the hill. Shut the gate. This track is unsuitable for cars, and doubtful for 4WD. If using 4WD, then at the gate across the track, turn left and park in the field. Take-off and top landing are straightforward. 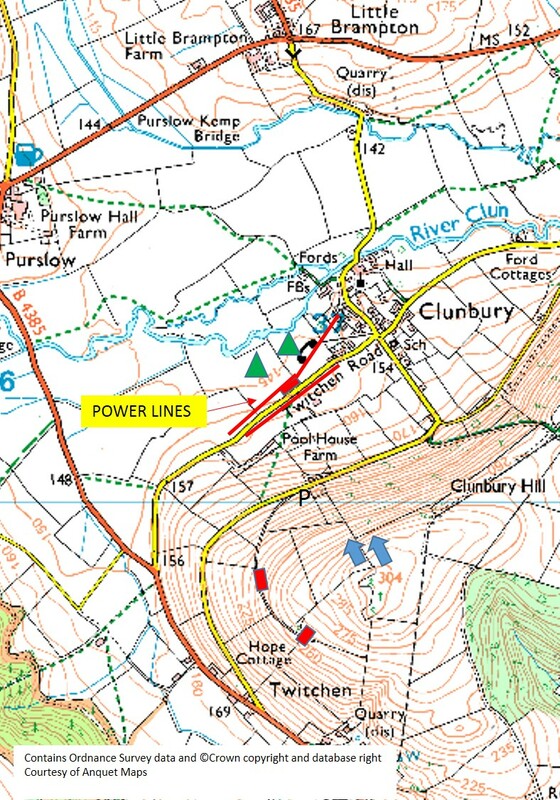 Bottom landing is in the flat field marked, but check the position off the power lines as these can make the landing difficult. These are indicated in red on the Google image above. Also check whether the fields are in crop, and do not land if this is the case – you will have to top/slope land. Birmingham CTA at 30m downwind.